For those of you who don't know....I make stuff. Lots of Stuff. Quilts. Braided Rugs. Hooked Rugs. Needlework. In the past I have canned jellies and ginger pear conserves for Christmas gifts. I have dried fruit and made wreaths out of them. I have made wreaths and garland from cranberries and fresh cut pines (That I cut down myself!) I made my wedding invitations with the help of a friend. I made the wedding table centerpieces too. Before Emily was born, I even started my own heirloom tomato seeds indoors in February. Over-achiever much? Now, my Mom was not a crafter really. Sure, she "macraméd" with the other ladies in the late 70's, but I never saw her collecting bolts of fabric, or sewing on the couch. She never sat me next to her and put a needle in my hand and guided me towards the finer points of needlework. As a child of the 60's, my Mom was not super concerned about her "home making" arts and our house was chaotic and messy and full of kids and animals. She worked full time and her down time was spent in the garden. It is hard to say when I got the urge to make things. Perhaps it was while I was still in high school and a neighbor introduced me to sewing. I made a few pillows from patterns...and began to expand outwards. I LIKED having something in my hands while I watched television in the evening. There was something oddly satisfying about the feel of fabric in my hands and the measurable progress I could see. At the University of Vermont, I did no crafting. I did, however, study feminist theory and women's history. I learned the history of the women of New England for it surrounded us. I learned about the things I had not learned from my History textbooks as a Vermont school girl, specifically the ways women surrounded all the events we had traditionally been taught. Like many college aged women who start to unpeel the onion of the empty spaces in our education, I was shocked. I was amazed. I was outraged. These events happened in places I KNEW. Places I had BEEN. And I had no idea. One of the books we were assigned was authored by a newish professor at nearby University of New Hampshire. She came to speak with us about her research for the book and tell us what she was working on at that point. The book was "Good Wives", the Author, Laurel Thatcher Ulrich. Her talk was electrifying in a way that I can still remember after 21 years. She was passionate. The stories she told us were rich and nuanced. She was working on the life story of a Maine Midwife then, something that would become "A Midwife's Tale". I would read the book when it was published, and later attend the film adaptation when it was shown at the Portsmouth Music Hall. I would again meet Laurel Thatcher Ulrich at that showing, and some descendants of Martha Ballard who still populated the area. Coincidentally, I had made my first quilt by that time, still reveling in the feel of fabric in my hands. My growing desire to create coincided with the publication of Ulrich's third book "The Age of Homespun", which I had pre-ordered from a local bookstore. I was a wife by that time, and "Making Things" helped me define my home. I could make a wreath from pine cones I had collected. If I could do THAT, how hard could it be to Make Garland? We were surrounded by trees, after all. Living in a fairly small town in New Hampshire, there was a certain expectation that you would Create Things. I am not sure how else to explain it, but it was assumed that you wanted to make your own quilts...or rugs....or wreaths...or jellies. When you walked into most houses, you would see evidence of handiwork - either through antiques passed down in families or new pieces in use. My quilting got better and better. When on maternity leave, I decided to take rug braiding lessons from a Quaker woman out in the middle of nowhere. Once a week, I would hand Emily over to her father and drive a half an hour to my lesson to be vaguely berated by the woman we came to call "The Mean Quaker". Mean wasn't the right adjective - excessively perfectionist may be a better descriptor. But I learned how to braid a Rug, damn it. A rug which still sits next to my bed to this day. During the worst of my post partum depression, I made quilts for Emily. It was, I later came to understand, the way I could show my daughter I loved her. Textile arms to wrap her when I could not connect. My quilts still cover her bed today. My latest obsession? 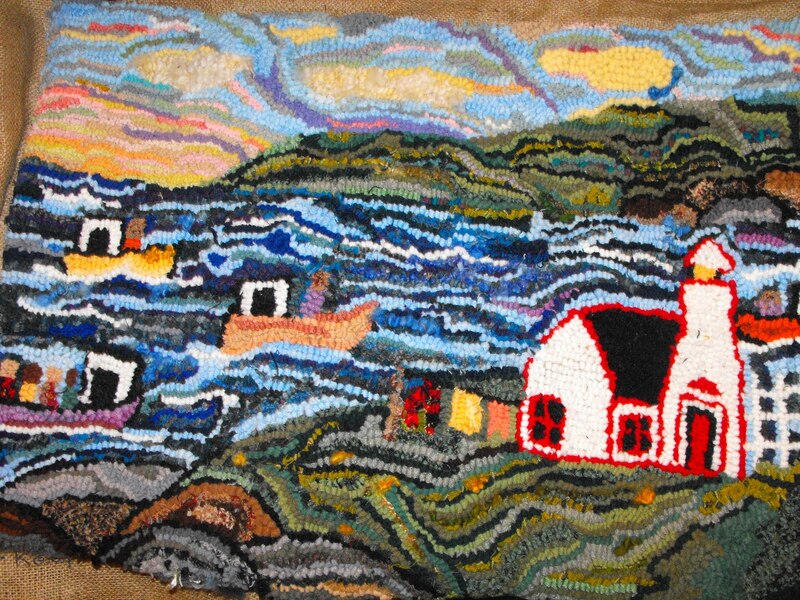 Rug Hooking. It suddenly occurred to me in March that it was something I had yet to learn...and so I pursued it. First finding a kit on the internet. I wanted to make sure I enjoyed the activity before investing in the equipment. I finished the first rug in a week. I finished the second rug two weeks later. The photo here is deceptive. This rug is very big - and almost finished. 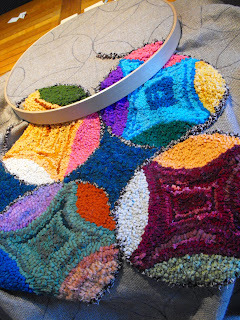 The next rug is already sketched out on paper to be transferred to the linen once I complete the circles rug. It will be one in a series of portraits of my Grandparents Homes, distilling all my childhood memories into wool and color. I don't make most things to give away It is rare that anyone gets a quilt. It has happened, but generally there needs to be a Wedding. Or a Graduation. I think I given 5 quilts away. The rugs are being made for the house, for me. When I read this article at BlogHer, I thought "Why Yes - This is exactly what I am doing." Perhaps unknowingly at times but always surrounded by ghosts of women who went before me. I am one of a long line of women who MADE things with our hands. From new, from used, from whatever was at hand. Making stuff, putting our prints all over the things that make homes and places comfortable. Things which are made to be used - not framed and saved - but Used. 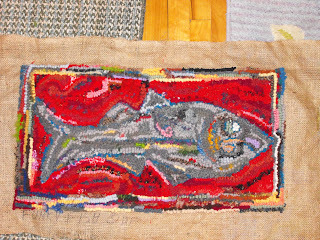 I realized it was what Laurel Thatcher Ulrich was writing about in all of her books - Women, shaping their lives through the lens of what is needed, expressing their creative voice through materials at hand - be that fabric, wool, or canned fruit and vegetables. When people ask me HOW I can create these rugs and quilts AND write the blogs AND work on my Dissertation AND Be Mom and Wife and Teacher...I don't really know what they want me to say. I do this all because I have to do this. Each role has pleasures and annoyances that balance and counterbalance each other and they all come together to form who I am. I am always amazed by you creative crafty types. I seem to be missing the "make stuff" gene. 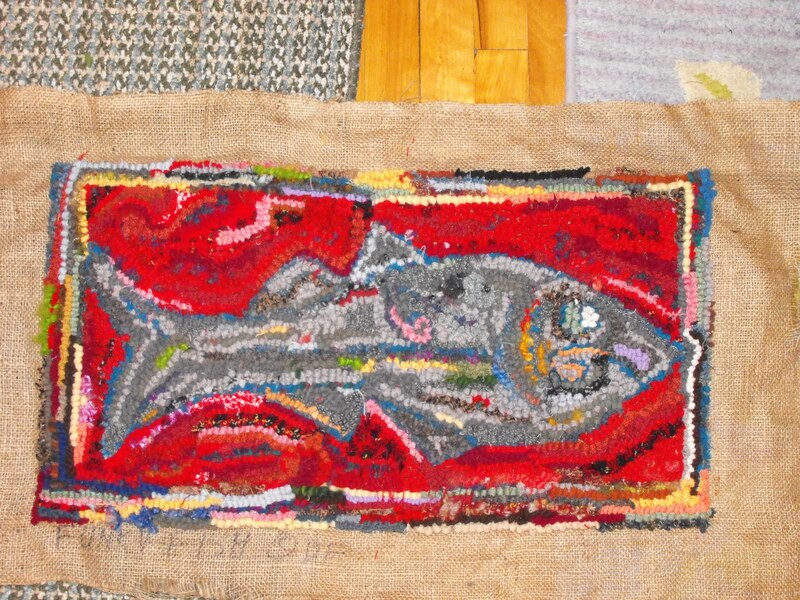 I'm a hard-core knitter, but my mom does embroidery and rug hooking. It kills me to hear my retiree round little mother talking about going to the library with the other hookers to work on a project, or how she spent the afternoon hooking down the street. They really need another word for that.